This warm cozy off shoulder red plus size top is one of Esh by esh couture plus size clothing items! 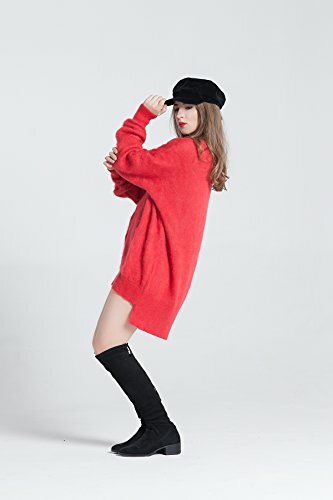 Wear this luxury red fuzzy knit pullover with a beret and it turns out to be French style fuzzy sweater, wear this knit red plus size knit pullover with a pair of jeans - and it is your beloved casual oversized sweater and designer clothing! If you look for a trendy oversize top, this high quality red plus size pullover is the one to fall in love. Loose longer model, v-neck, wider sleeves designed with handknit braids and a vertical braid for a fit silhouette - all this makes this knit red loose sweater unforgettable! ‍ We work on our new charity project欄, where that red sweater is THE start - already now we promise to donate 50% of our profit from that red sweater sales to charity fund that helps deafblind people to speak, get heard and get seen 酪爛 If you buy this sweater now, you will be one of the first people to support #that_redsweater movement! Without you, we can not make it happen! ❤️ ⚜️ Only top quality yarn had been selected for creation of this item: Angora The mix of yarn may vary for your item due to availability at the time of the order - we will knit it from high quality yarn only. ☀️ DON'T FEEL LIKE RED? - It is also available in beautiful golden-yellow color of the morning sun! - Other colors and types of yarn can be requested for customized order. ✔️ ITEM OPTIONS: 1) - v-neck - classic round neck - turtleneck 2) - Yarn A: Angora - 300eur - Yarn AA: Angora 40%, cashmere - 350eur - Yarn AAA: cashmere 100% - 400eur ❤️ CARE INSTRUCTIONS: Delicate Handwash only at 30C max. No bleaching. Delicate loundry detergents recommended. (for wool, silk, cashmere, hand-wash) No tumble dry. Do not squeeze after washing. Lay flat to dry. Delicate Dry Cleaning for wool items is allowed.